The star of our beef barley soup is a rich, intensely flavored beef stock. We were able to make a from-scratch stock in about 2 1/2 hours thanks to a lot of browned beef (we preferred shank) and a few small bones. As a bonus, the shank meat turned soft and gelatinous, perfect for shredding and adding to the soup. 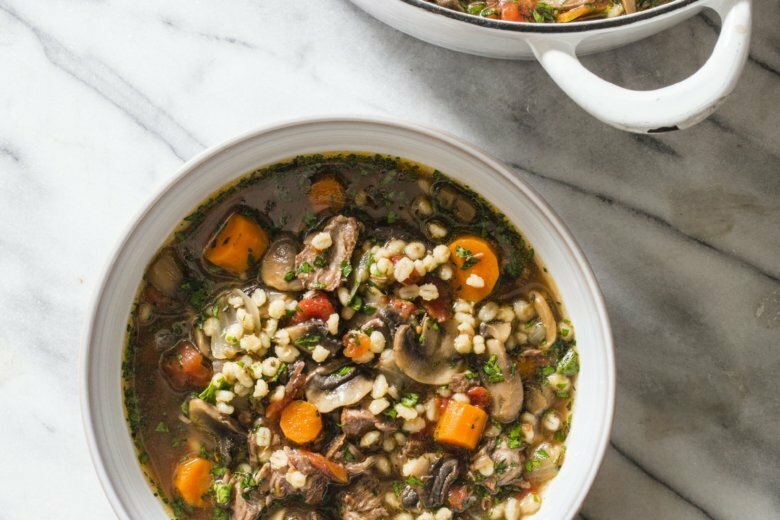 Mushrooms complement beefy flavor, so we used them for an even meatier-tasting soup. Mulling over the choice of what barley to use, we settled on pearl barley because it is a quicker-cooking grain. Adding fresh thyme early on allowed its robust flavor to infuse the broth evenly while diced tomatoes added complexity and some acidity and helped balance the heartiness of the barley. Making a beef noodle soup variation turned out to be a cinch: We simply swapped hearty wide egg noodles for the barley and simmered them right in the broth. You will need the stock and 2 cups of cooked beef (either from the shank or from the chuck) from Rich Beef Stock (recipe follows) for this recipe. Heat 1 tablespoon oil in stockpot or Dutch oven over medium heat until shimmering. Add onion and carrots and cook until vegetables are almost soft, 3 to 4 minutes. Add remaining 1 tablespoon oil and mushrooms and cook until mushrooms soften and liquid evaporates, 4 to 5 minutes longer. Add beef stock and meat, tomatoes, barley, and thyme. Bring to boil, then reduce heat to low; simmer until barley is just tender, 45 to 50 minutes. Stir in parsley, season with salt and pepper to taste, and serve. This recipe for a rich traditional beef stock delivers a stock with great body, lots of beefy flavor, and a generous amount of meat. It took 6 pounds of beef and bones to make it. Here’s why: Roasting and simmering just beef bones with some aromatic vegetables yielded beef stock that tasted like bone-enhanced vegetable liquid. We figured out that it was going to take more meat than bones to get deep beef flavor. We tested different cuts of beef and shanks, a common supermarket cut with exposed marrow bones, were our favorite, followed by marrow bone-enhanced chuck. Not only was the shank meat soft and gelatinous, it was perfect for shredding and adding to our beef soups. We used one lone onion as our vegetable and enlivened the stock with a modest 1/2 cup of red wine. Unlike other traditional stocks, ours was done in about 2 1/2 hours and was a one-pot, stovetop-only affair. Note that you need only 2 cups of the cooked beef for our soups, but the leftover beef is delicious and also good for sandwiches. Use a Dutch oven or stock pot that holds 6 quarts or more for this recipe. Cooled stock and meat can be refrigerated separately for up to 4 days or frozen for up to 1 month before being used to make soup. Heat 1 tablespoon oil in stockpot or Dutch oven over medium-high heat until shimmering. Add onion and cook, stirring occasionally, until slightly softened, 2 to 3 minutes. Transfer to large bowl. Brown meat and bones on all sides in 3 or 4 batches, about 5 minutes per batch, adding remaining oil to pot as necessary; do not overcrowd. Transfer to bowl with onion. Add wine to pot and cook, scraping up any browned bits, until wine is reduced to about 3 tablespoons, about 2 minutes. Return browned beef and onion to pot. Reduce heat to low, cover, and cook until meat releases its juices, about 20 minutes. Increase heat to high; add boiling water, bay leaves, and salt. Bring to boil, then reduce heat to low, cover, and simmer slowly until meat is tender and stock is flavorful, 1 1/2 to 2 hours, skimming foam off surface. Strain stock through fine-mesh strainer and discard bones and onion; reserve meat for soup or other use. Let stock settle for 5 to 10 minutes, then defat using wide, shallow spoon or fat separator. Nutrition information per serving: 439 calories; 199 calories from fat; 22 g fat (2 g saturated; 0 g trans fats); 59 mg cholesterol; 540 mg sodium; 21 g carbohydrate; 5 g fiber; 4 g sugar; 36 g protein.